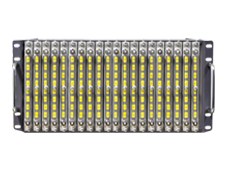 The Dense Intelligent Multi-Access (DIMA) is a headend splitter/combiner assembly in a 1RU or 5RU 19 inch chassis. Each module can integrate 3× double splitters, 2× four splittersor 1× eight splitters. The DIMA platform is designed to operate as an RF splitter or combiner in both forward and return path configurations. It can be deployed in virtually any HFC environment and each port’s link attenuation can be independently adjusted to balance RF levels. A single DIMA platform can be fitted with up to 160 input / output ports with every RF port having 1000 Vdc of voltage blocking. It also features excellent RF characteristics spanning 5 ~ 1218 MHz with each port having 30 dB of isolation. (1) The not used ports are terminated by 75 ohm load. (2) The test point is a unidirectional coupler used for monitoring the input of a splitter (5Axx); for 5Cxx, the test point’s deviation may vary due to differences in insertion loss with different modules. Example: 5Axx: -20 ± 1 dB; 5Cxx: -(20 + module insertion loss) ± 1 dB. (3) Minimum between all the ports.